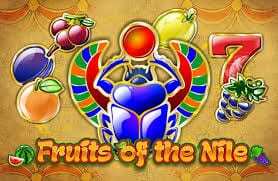 Fruits of the Nile is…you guessed it, a game that mixes an ancient Egyptian theme and some traditional fruit machine symbols. When you begin this game you will initially be greeted with a blue scarab beetle, however, don’t be alarmed. Once you’ve bypassed the beetle you are safe in the tomb and free to spin through 5 reels of juicy fruits and win yourself a whole bunch of free spins when you try playing these casino slots now! Since 2011, Playson has been bringing you entertaining and high-quality online slot games and are showing no signs of slowing down. This Malta-based games Developer Company hasn’t been around for very long but already they have made a big impression on the gambling industry with its high definition graphics and innovative gameplay. They already have 30 online slot games with new and exciting themes, and with more games forthcoming you are going to want to pay attention to this developer. Check out new slot games from Playson today! 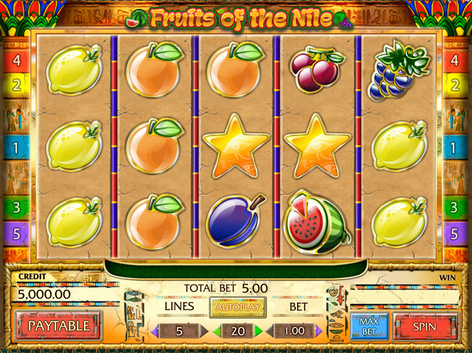 Some top slot games like Fruits of the Nile has combined two classic themes in one: Egyptian and the fruit machine. The River Nile is renowned for its vitality as gave life to the fields and gardens of Ancient Egypt so it makes perfect sense that the classic fruit machine has been given an equally fruitful theme. Set against a sandstone wall, with faded hieroglyphs. Each fruit symbol is encased in gold giving them an overall jewelled effect which adds to the richness and splendour of the theme. The RTP (Return to Player) in this online slot game is 95.37% and has been modernised with only 5 paylines and 5 reels, so it’s easy to understand. The reels are decorated with classic fruit symbols such as cherries, watermelons, grapes, oranges and lemons. You’ve also got some special symbols in the Scarab Beetle and Star. The Scarab Beetle is your Wild symbol for this slot game, it will substitute for all other symbols except the Scatter to help you complete winning combinations. The Star is the Scatter symbol in Fruits of the Nile, landing 3, 4 or 5 of these symbols anywhere on the reels will reward you with multipliers of 5x, 10x or an impressive 100x your total bet! If you’ve ever played a Playson game you will be familiar with the Gamble Feature. This mode is offered after every winning combination and you have the option of either doubling or quadrupling your winnings per round. In the doubling-or-nothing mode, you have to guess the correct colour of the card to win. If you choose to chance your winnings on the quadruple feature you will have to guess the correct suit of the card, guess correctly and your winnings will be multiplied by 4x. However, if you guess incorrectly in either mode you will forfeit your winnings so place your bets wisely. You can play the Gamble Feature up to 10 times in a row. Fruits of the Nile is straightforward and easy to understand, so even if you haven’t played an online slot game before you’ll be able to get started and have fun. The graphics are beautifully rendered in keeping with the Ancient Egyptian theme, you can tell that the developers were fully committed to the design of this game giving it that high-end seal of approval. While this game is simple with its no-frills, Playson’s trademark Gamble Feature is well-loved and can give you some impressive cash prizes.